Lo and behold, it sat there in my inventory, staring at me like a golden ticket to a chocolate factory. The extremely rare Black-Black dye. I’ve been wanting that since dyeing had been incorporated into the game. 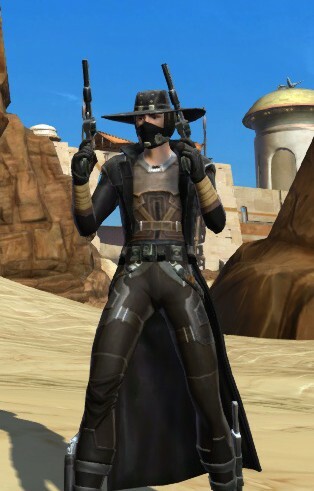 Now, my main is a Gunslinger, and I wear the Troublemaker’s Duster. To simulate the Black-Black dye, I just sidle up to it with the Black-Dark Green dye. It is close, but not quite. And now I open that box on my Guardian, and it is STUCK on her?!? Then I remembered something that had annoyed me about SWTOR. They had given everyone Nico Okarr’s Duster, and it was identical to the Troublemaker’s Duster. I thought this was ridiculous, especially as a sub reward, as I had the whole Troublemaker set unlocked in collections a long time ago! I could print as many copies as I wanted, I didn’t need a reskin. 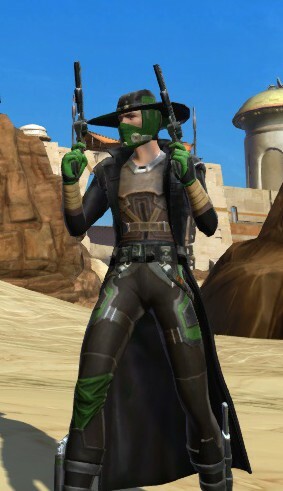 But joy of all joys, SWTOR had actually done something beautiful on accident. They made Nico Okarr’s Duster LEGACY BOUND! That means that dye placed in that beautiful item’s slot can be transferred to other characters and worn. That being said, they are also introducing a wonderful new technology that allows you to pick whether you are on a PvP instance or a PvE instance, which means that they can trim down the servers (not sure if that is the plan), and I can have PvP fun on the Harbinger! Is there anything SWTOR is doing/could do that would make you want to come back? I’m actually content with what I have now in the game, except for the plethora of bugs. I wish they’d focus on those a bit more.